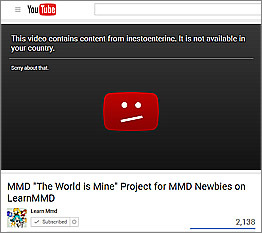 Why did YouTube take down my MMD video? … and YouTube has taken-down the sample video I posted as part of the tutorial. (I just, now, uploaded it, again, through my personal YouTube account rather than the LearnMMD account where it used to be… we’ll see how long it stays up “:o). This tutorial helps you create a music video. DO NOT UPLOAD IT TO YouTube! if you upload this video to YouTube! YouTube has been enforcing copyright issues and is blocking many MMD videos of our favorite songs; including “The World is Mine” that is used in this tutorial. Our use of copyrighted materials, even as not-for-profit hobby entertainment is now viewed as an undesirable, perhaps illegal redistribution of copyrighted materials. YouTube may block the view of your video to some countries or may simply block it to all viewers. If you “get caught” more than a few times, your YouTube Channel may be penalized. THIS TUTORIAL creates an “illegal” video. DO NOT UPLOAD it to YouTube… and keep an eye on the YouTube situation… maybe things will change someday… ? … but be thoughtful… be careful. Use only “safe” music… music you have personally created, music you have permission to use… or run the risk of “getting caught” and perhaps being punished by YouTube. Use alternate versions of the song… see which versions of your favorite song ARE STILL on YouTube… might be that only the one version published by the well-known singer/star/group will get flagged as “matching”… and a Vocaloid knock-off will slide by! As for myself, I typically use “old” music that I scavenge from my LP collection. YouTube often flags my videos as “Matched Content”, the first stage of being in trouble… but, except for seeing more ads clustered around my videos selling downloads of the music I have used, I have never been punished beyond seeing that “Matched Content” warning. Also, I will, in the future, only “do” the songs that are still prevalent on YouTube… ones YouTube hasn’t taken down yet… maybe those are OK, somehow… ? … who knows? Disclaimer: I am not a lawyer and nothing I write here should be construed as legal advice. the model, the character the model portrays, the music, other audio components, the MMEs used, the ancillary models (stages, skydomes, etc. ), the motion data used, the song – yeah, the song. Song writers have rights too! Transgressions in these instances with regards to the music rights usually at worst gets the video deleted or muted. No one is going to sue a kid. It is bad PR. Likewise no one is going to send the Yakuza after a kid over something like this. The safest way to make money on YT is to create original content. That said, you can actually moneterize a channel devoted to video games. Game companies tacitly encourage this as it helps maintain the shelf life of their titles as well as being generally advantageous from a marketing perspective. But what if the company said,”we have a direct relationship with Google and you did create the visuals. We run the advertisements based on the visual aspects to the video and not audio.” It’s fine right? What you you mean by “the company said”? You either use other people’s resources or you don’t. If MMD models, stages, and effects used in the video are not created by you (and I mean *fully* created, not just assembled from pieces in PMDE like most MMD models are), then a company that claims that you “created the visuals” simply shows its incompetence in the matter. As for the audio, if it’s copyrighted, you can’t monetize the video no matter what your company says. It’s you who risk your channel, not them. While you’re not monetizing your videos, using other people’s resource is mostly a matter of ethics. When you try to monetize, you’re traversing the territory of the law, and there are plenty of sharks who would be all too happy to squeeze away your house, your car, and your firstborn if you misstep. The rule of thumb is “if you don’t know what you’re doing, better don’t do it”, and in this case, you clearly don’t, or you wouldn’t be asking here. Would changing the pitch or speed of the track I’m using make my video any less likely to be detected as matched content? I believe it’ll reduce the chance to get detected by the bots used to automatically identify them. The owner is still able to manually take your video down though (happened to me once), but it does not happen THAT often. To be safe, just look around Youtube, see if the tracks you’re going to use also exist in other video (search for a certain anime OP for example). If it exists, and the video of it was up for a respectable time, and not done by the official owner, then it’ll most likely be fine even without changing the pitch or anything. Usually the most you’ll get hit with is being unable to monetize your video, which is not exactly an issue unless you’re planning to make money out of your video. I’d like to clarify some things: Most Vocaloid songs are actually SAFE to use without the risk of getting copyright bans. However, a few Vocaloid producers have exclusive rights to their music (similar to Sony Music’s rights to theirs I think?). A majority of Vocaloid producers allow their music to be used as the fans wish, so as long as it is not used for commercial purposes. The bans don’t apply to NicoNicoDouga since users automatically have a license to use them, and the company who owns the site pays for the royalties. I have been using MMD for a while now, I also have some video`s on YouTube. I think youtube will look more to video`s that have been monitized. I never monitize any video. But this is really a thing to take in mind when uploading to YouTube. I have got the matched content warning but probably it shouldn`t be a problem. Unless you fight it. Just agree with it. If you agree with these conditions, you don’t have to do anything. This is a message that you recieve when copyrighted content is auto detected. You can get different messages. So upload your video as private and wait if you recieve a match. Read what it says. In my case it says: “The claimant is allowing their content to be used in your YouTube video.” this means that the author allows his/her content to be used freely but all ad revenue will go to them. I will be more carefull in the future I guess. This has happened to me numerous times whenever I use copyrighted music. You’re not in trouble so you don’t have to worry. YouTube is simply reminding you that you have copyrighted music in your video. The best thing to do is… well… you don’t really have to do anything. Back then, The system was a little complicated. If the video you uploaded had copyrighted content, a notice would be sent to you. You could either deny the claim or acknowledge it. The video would be temporarily taken down (or blocked in some countries depending on the copyright) until things get sorted out. Today, leaving the notice as is basically means that you acknowledge the fact that the content in the video is not yours. Yeah that is true as long as it doesn`t get taken down your fine, I guess.